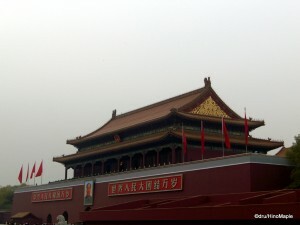 With the Beijing Olympics over, I thought I’d write about my trip to Beijing. I went to Beijing in December, 2007 for 4 days. I met up with my father who would be my tour guide for the trip. Many people say China is a scary place and dangerous. In fact, it is safer than you expect. Just don’t expect to feel 100% free. It is a communist country and the police and army are everywhere. We arrived on December 1st. People say that summer is a horrible time to visit Beijing because of the smog. However, I’d say it’s still nice because it would be a lot greener. I went at a time where everything is grey and red. It felt very “communist”. Imagine troops marching in Tiananmen Square with no signs of life, other than the military marching by. That’s what Beijing felt like in Winter. We saw Tiananmen Square around sunset. I got to visit the political hall and the square itself. They just closed the political hall, but if you have money, you can get in a little late. Just pay more at the “side” entrance. After the political hall, we headed to the square to see things. I wasn’t as impressed as I thought I would be, until the lights turned on. Tiananmen Square has a certain ambiance at night that can’t be explained. After visiting Tiananmen Square, we headed to dinner to enjoy some Peking Duck. Cheap, delicious, and plentiful. I had enough Peking Duck for a year. 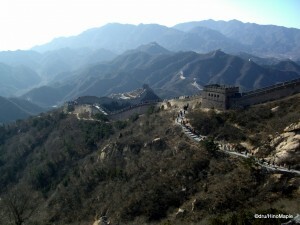 On the second day, we headed to the Great Wall of China. It’s about 1-2 hours outside Beijing, but a definite destination for everyone. We spent the afternoon there and it was wonderful. We took the gondola up and discovered that it was extremely windy at the top. It was so windy, it felt like the gondola would fly off. We were tilting at about 40 degrees, I think. By the time we got onto the wall itself, you could feel the bitter cold. The wind dried our skin out completely. The wall is both easy and difficult to climb. Some sections, you are climbing straight up the mountain. Others, have huge steps, or a gradual slope. I made a point to visit one of the guard towers and it was a lot of fun. I felt like a kid pretending to be a guardsman. I can imagine what it would feel like to be stuck up there, waiting for days. Very boring. After, we drove back to the hotel to relax before heading to dinner. For dinner, an old family friend picked us up and we headed to a Tibetan restaurant. We had a delicious dinner, and I must thank my dad and his friend for taking us there. I can’t truly describe real Tibetan food. I’m not sure if it was truly authentic, but I’d like to believe it is. Tibetan food is a mix between Indian and Chinese. Somewhat dry, lots of lamb, and very spicy. The spices they use remind me of Indian food, but the preparation and style is more Chinese. They also have a type of goat milk tea. It’s somewhat sour, but delicious. It must be warm. 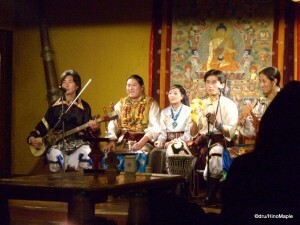 We were even treated to a wonderful show performed by what I assumed to be real Tibetan-Chinese people. I couldn’t start to describe the songs and dance, but I recommend you to YouTube it. Afterwards, we headed back to the hotel to sleep. On our third day, we visited the Forbidden City and the Temple of Heaven. 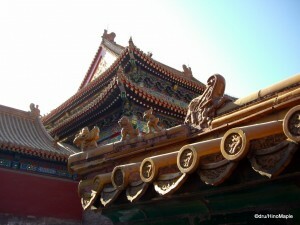 The Forbidden City is the Imperial Palace of the last Emperor. It is a vast complex with beautiful buildings. Unlike Japanese buildings, these are red with very beautiful designs in the crown. The city was being renovated due to the Olympics, but I’m sure the rest of it is very beautiful. I could easily spend an entire day trying to explore the city, but I didn’t have the luxury of time on this trip. We even visited a nice park behind the city. The park has a small hill you can climb and see the entire city. Because it was Winter, we could see everything, but in the far distance, it was a little smoggy. 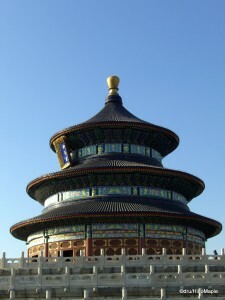 The next stop was the Temple of Heaven. It is a beautiful park that has a few attractions. The main temple is a beautiful round wooden building with wonderful art work. It was a beautiful day which made things much better. The details on everything was exquisite, and I couldn’t believe they did it such a long time ago. There was a “hall of echos” where you can send secret messages along a curved wall. You can’t see the other person, but you can easily talk to them. Sounds like a horror movie, but it’s scientifically interesting. The last thing to do is to stand on a stone and start talking. Your voice will resonate, sounding more beautiful. As if you have a slight echo. This is another must see place in Beijing. On my last day, I just walked around the hotel and visited many shops. There was still 9 months until the Olympics, but they were going full tilt on Olympic fever. You couldn’t walk anywhere without them showing Olympic related goods. The spirit of the Beijing people was quite good and people seemed generally friendly. Albeit a little capitalistic at times, they were generally nice. If you visit Beijing, I do recommend a good guide. I also recommend that you be careful. Car drivers are number 1. They will not always wait for you to cross the road, and they go anywhere on the road. When in a taxi, close your eyes and pray you are okay. Generally, it’s true. If you are worried about taxis, I’d recommend taking the subways. Just be ready to spend 10 minutes figuring things out, but generally, it’s simple to use. This entry was posted in East Asia and tagged Bandaling, Banri no Choujou, Beijing, China, Forbidden City, Great Wall, Great Wall of China, Temple of Heaven, Tiananmen Square by Dru. Bookmark the permalink.